This little raccoon can be a bit of a troublemaker. He loves to explore and is always finding himself in odd situations. 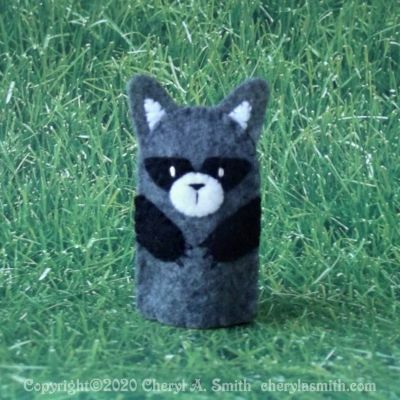 This finger puppet is hand embroidered and stitched in polyester felt from an original pattern. The body measures approximately 1-1/2 inches by 2-1/2 inches and will fit most fingers. No glue is used in the creation of any puppet. Everything is firmly stitched in place. Each raccoon is an individual - so facial expressions and stitching may vary slightly from the photo.